We use in cleaning after metal processing. Anyway it's easy. In addition, we are active when we lost screws, bolts by maintenance of car and lost sight. This review is about item#9316325. ・ I want it to be easy to understand because it is difficult to understand where the magnet is, and it may roll on the back. ・ It is good that the handle is extended, but it is difficult to use because the extension can not be done to release the magnet, and the cover of the tip was removed immediately and was difficult to use. The nails and staple pins that fix the lapping of the wood could fall and cause a tire puncture, so the safety was improved by cleaning regularly. It is very helpful because it has an adsorptive power and it can be cleaned first because it can be quickly recovered. I ordered one for the first trial, I liked it, so I asked for two next and asked three more. Anyway, I asked 10 additional books. Every day in the factory everyone is doing the colloquial with 16 in total. Every day the factory is beautiful, the price is cheap and it is very active. One opinion came out because the part of the caster looks weak, so I hope not to break immediately. Often a plurality of needles of a knitting machine are broken at the same time, and fragments are scattered around the machine. In the past, we used collecting work to search all over using bar magnets etc. By using this broom, it became possible to collect a wide range of debris at once. Also, even after collection, you can also dispose of debris with one lever, so there is no need to worry about injuring your fingertip. I am very satisfied. Nail picking around the company warehouse. It was awesome, while dragging bigger magnets with a strap while taking time to remove the nails etc, but with this product there is a lot more nails than ever before now ... now I thought that I went through the place where so many nails remained by car ... I should have bought it earlier that I could reduce the time to pick up nails and shorten it to time. This is a bargain for ¥ 3,790. It is a 3rd or 4th repeat. Handling roughly will break immediately, but it will work more than the price. Cleaning is very easy and I am very satisfied. It is perfect for cleaning around machines, I can also sort other kinds of iron, the highest, more iron powder can be taken one more touch and this is also the best. This review is about item#09316325. 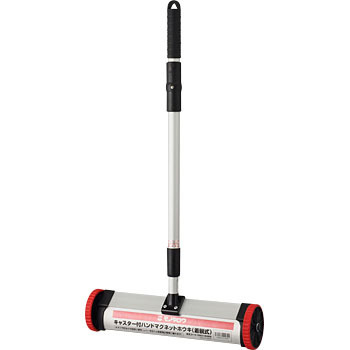 Various people said that the floor cleaning of concrete became easier. Since there are coma, it is easy to operate. Magnetic force always comes out and magnetic force can be stopped by slide, but hope to stop magnetic force when not in use. There is concern about adverse effects on precision equipment due to storage place and magnetic force.